Balnhdhurr – A Lasting Impression is presented by Artback NT in partnership with Buku-Larrnggay Mulka Centre. Balnhdhurr is a vibrant acknowledgement of the creative energies, talent and commitment of generations of Yolngu artists who have utilised and pushed the boundaries of printmaking to share significant cultural and historical stories. 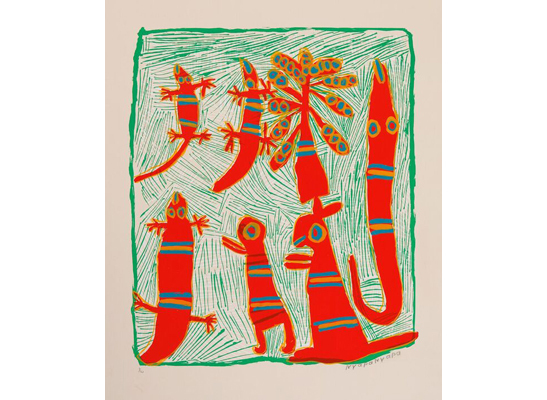 TMAG is delighted to host this significant retrospective exhibition that celebrates twenty years of continual print production by locally employed and trained Indigenous printmakers at the Yirrkala print space. The artists featured in the exhibition have established a worldwide reputation and are part of one of the most significant and successful art movements to come out of Australia over the last twenty years. With works from over 50 artists, this exhibition includes prints that are historically significant. The Berndt Etchings series draws direct inspiration from the Berndt Crayon Drawings of Yirrkala, produced by the artists’ predecessors in 1947, while String Figure Prints are a response to another archaeological collection from 1948. Pieces in Balnhdhurr also reveal the significant impact the introduction of bright acrylics had on artists, which allowed them to explore a whole new genre of artistic storytelling that became a joyous explosion of colour and expression. Balnhdhurr is a coming together of cultures and time, providing an opportunity for a wider audience to recognise the accomplishments of a sustainable, functional and thriving print studio operating in an isolated landscape on the coastal peninsula where the Arafura Sea meets the Gulf of Carpentaria. This project has been assisted by the Australian Government through the Australia Council, its arts and funding advisory body. Balnhdhurr – A Lasting Impression is on show in Argyle Gallery 4 from 15 December 2017 until 12 March 2018. For more information, visit the website. (top) Nyapanyapa Yunupingu, Hunting Dhawu (2001), screenprint, 47 x 39cm. 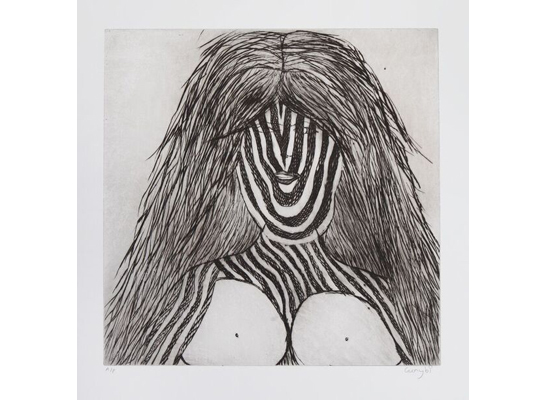 (middle) Gunybi Ganambarr, Yirritja Women (2013), etching, 40 x 40cm. 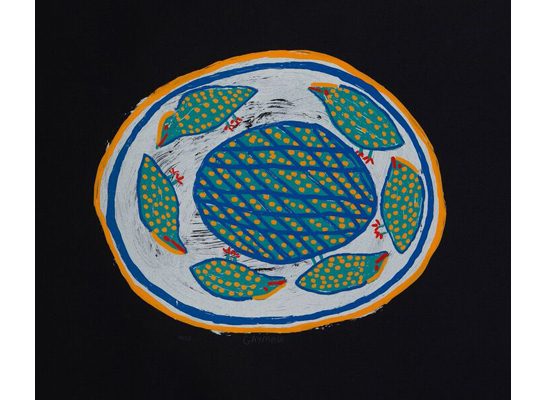 (bottom) Gaymala Yunupingu, Djirkitji (1998), screenprint, 40 x 40cm.